The ANC pioneers took the time to get wireless right, but audiophiles won’t be impressed with these cans. Bose introduced consumers to its first active noise-cancelling headphones way back in 2000. While its noise-cancelling tech is arguably second to none, Bose’s ANC cans have always been a wired affair. This changed in June with the introduction of the QuietComfort 35. Available for $432, Bose’s QuietComfort 35 are inarguably a premium set of headphones. Available in black or silver, the QC35 are housed entirely in nylon, leather, and a soft suede-like fabric. It’s a strange mix. The nylon feels cheap in the hand, but is nonetheless sturdy. The leather ear muffs are luxuriously cushioned and supple to the touch, but I fear for their long-term longevity in the hands of anyone unfamiliar with the use of leather conditioners. The faux suede, swathed over the cushioning on the underside of the QC35’s headband, is a stroke of thoughtful genius: pleasant to look at and soft to the touch, it had just enough of a tooth to keep the headphones planted on my freshly shaven head, even while I laid down to listen to some music. No doubt, the decision to use these lightweight materials was made to compensate for the heft of the electro-guts required for the headphones to work their wireless magic. At 10.9 ounces, they weigh more than their closest non-wireless ANC-capable relation, Bose’s QC25, by four ounces. 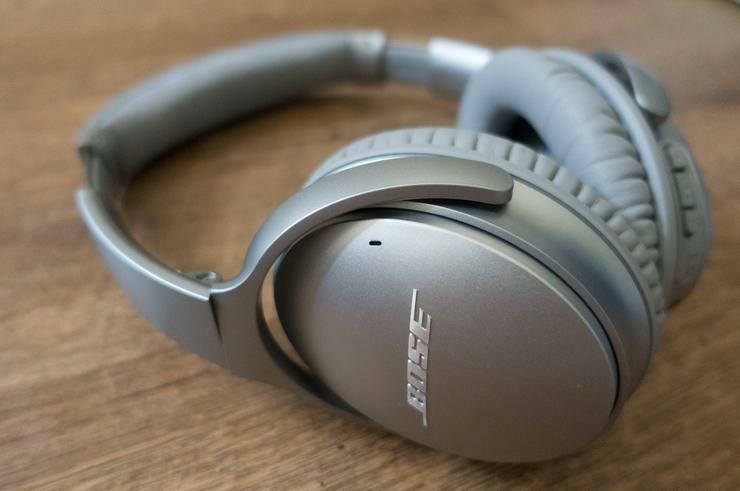 By keeping the QC35 as lean as possible, Bose has introduced a product that you won’t mind wearing all day at your desk or on a cross-country flight. Happily, the headphone’s battery life allows for exactly that. Available in silver or black, Bose’s QuietComfort 35 headphones boast a sleek design. Bose promises 20 hours of wireless ANC listening on a single charge, or 40 hours of ANC and audio if you plug the QC35 into your music device with its included 3.5mm analog cable. I found these usage estimates to be pretty accurate. On the off chance that you do run out of juice, the headphones can also be used passively, provided the analog cable is attached. Some users will gripe about the fact that the cable doesn’t come with a microphone or a remote control baked into it for use with a smartphone. I’m not one of them. The QC35 are designed for wireless listening, with an analog out provided as a backup or for use with an airline adapter. The headphones can be paired with two different devices via Bluetooth or NFC at once. Switching between audio sources is as easy as flicking the QC35’s Bluetooth/power switch, or by using the Bose Connect app (which is available for Android and iOS devices) to select which source you’d like to listen to. The QC35’s micro-USB charging port, power/pairing LEDs, power/pairing switch, volume- and track-control buttons (the latter of which allow for Siri use and to accept or decline phone calls) are all contained in the right ear cup. In the bottom of the left cup, you’ll find the analog input I was just telling you about. Dual microphones in the right ear cup ensure call clarity in noisy environments. Using them in the windstorm that is south central Alberta in the springtime, I had multiple callers tell me that they were able to understand what I was saying with no difficulty. 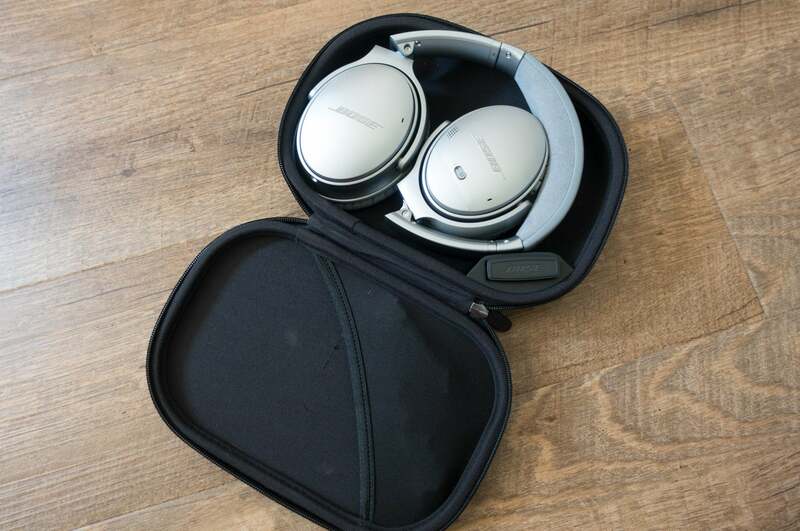 To keep your investment from meeting its doom, crushed by books in your backpack or at the hands of a rambunctious toddler, Bose ships the QC35 with a protective case that’s just big enough to house the 7.1 x 6.7 x 3.2-inch headphones when folded. The QC35 come with a sturdy case to protect the headphones when not in use. There’s no way to disable the QC35’s active noise cancellation; only when the QC35’s battery dies will you be subjected to the din of the world around you. I’d take umbrage to this if the QC35’s battery life shorter, but it’s hard to argue with 20 hours of use. 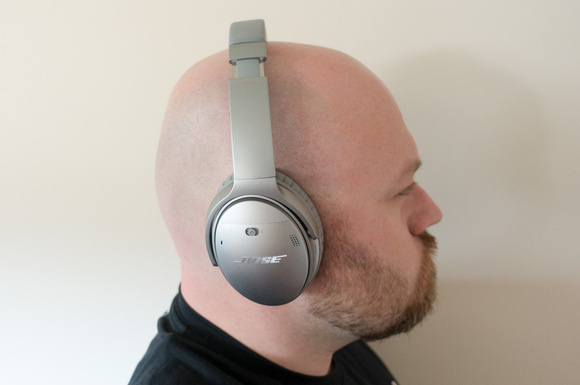 It’s even more difficult to argue with the quality of noise cancellation that’s delivered. Simply put, the QuietComfort 35 provide the best active noise cancellation that I’ve ever experienced in a set of consumer headphones. Last week, I sat next to a highway onramp, roughly three miles from my home. The QC35s almost completely blocked out the whine of the nearby highway. The same can be said for the cars, buses pickup trucks and transport trucks that sped up the onramp. I subjected myself to 90 decibels of A-weighted pink noise in my office, too; again, Bose’s ANC technology kept me from hearing any of it. But it’s not perfect. Wear the headphones in a coffee shop and you’ll hear the blathering, albeit muffled, of the people around you. The screams of a baby on an airplane? That’ll cut through, too; but the headphones will keep it quiet enough that the kid’s airborne rhapsody won’t mess with your calm. So, the QC35 keep sound out well enough, but how are they at making it? For most listeners, not bad at all; audiophiles, however, need not apply. With the QC35, Bose employed digital signal processing (DSP) and a variable EQ to sculpt the sound of the music coming out of the headphones. In plain English, this means that the sound of the headphones will change, depending on the frequencies of the songs you’re listening to and the volume your music is at. The QC35 are comfortable enough to wear all day, and they have the battery life to allow exactly that. Listen to your music at a low volume level and Bose gives you more bass. The louder you listen, the less low-frequency sound the headphones produce. This might seem like a bum deal, but it’s cool: our brains tend to believe they’re hearing more low-frequency noise at higher decibel levels than they actually do. The result of this tweaking is that at low volumes, you’ll find your music sounds merely acceptable. But at mid to high volume levels, the audio will shine with a great balance of low-frequency sound and sparkling mids and highs. Jason Raso’s ‘White Russian Waltz’ (from Man of 40 Faces) let me enjoy the ringing resonance of Fancesco Pinetti’s vibraphone work without any shrillness while the smooth low-end of Raso’s bass sounded deep enough to rattle the fillings out of my skull. Listening to The Legendary Shack Shaker’s ‘Shake Your Hips’ (Cockadoodledon’t) yielded the wall of southern-fried sound I hoped it would. Cranked up as high as my iPhone SE would allow, J.D. Wilkes’ high pitched warbling and harmonica scorched a hole in my brain, just the way it should. All the while, the only distortion I heard was the stuff intentionally recorded in the studio. Should you buy a pair? That said, for the money, the QC35 are not the best headphones I’ve slapped on my ears. Bowers & Wilkins P5 Wireless, for example, retail for the same price and offer, in my opinion, superior sound without EQ sculpting. If ANC isn’t important to you, you may wish to seek those out instead. While they don’t offer the best audio experience for the money, Bose’s QuietComfort 35 headphones sound very good. If you’re not satisfied with passive noise cancellation’s ability to eliminate background noise—such as the drone of an aircraft engine or an air conditioner—these cans deliver the best active noise cancellation in any headphone, wired or wireless, I’ve tried.